About This Sixth Scale Figure. The release of the long-awaited. Star Wars: The Force Awakens. Featuring a cast of new and familiar faces, the epic sequel takes fans on a very exciting journey in a galaxy far, far away! Sideshow Collectibles and Hot Toys are thrilled to officially present the sixth scale collectible figure of the movies heroine Rey! Rey is a resilient survivor, a scavenger toughened by a lifetime of dealing with the cutthroats of the harsh desert world of Jakku. 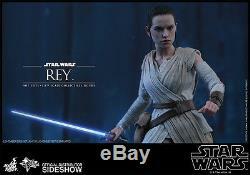 The highly-accurate collectible figure is specially crafted based on the image of Daisy Ridley as Rey in the film featuring a newly developed head sculpt, three interchangeable looks, finely tailored outfit, a lightsaber, highly detailed accessories, and a hexagonal figure stand with the Resistances emblem. Now is the time to add the new. Heroine to your growing collection! What's in the Box? 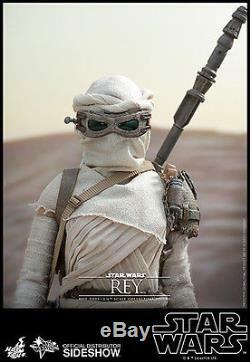 The Rey Sixth Scale Collectible Figure specially features. Authentic and detailed likeness of Daisy Ridley as Rey in. Newly developed head sculpt with a highly-accurate facial expression and make-up. Head wrap with goggles can be freely worn onto the head sculpt to achieve 2 additional looks. Body with over 28 points of articulation. Six (6) pieces of interchangeable palms including: - One (1) left fist - One (1) relaxed right palm - One (1) pair of palms for holding staff - One (1) pair of palms for holding blaster. Six (6) pieces of interchangeable gloved palms including: - One (1) left fist - One (1) relaxed right palm - One (1) pair of palms for holding staff - One (1) pair of palms for holding blaster. Each head sculpt is specially hand-painted. One (1) beige wrap dress. One (1) pair of beige colored arm wraps. One (1) detachable left shoulder pad. One (1) leather-like left wrist cuff. One (1) brown belt with pouch. One (1) pair of beige pants. One (1) pair of dark grey boots. One (1) staff with strap. One (1) lightsaber with blue colored blade. One (1) leather-like backpack with accessories. Resistance emblem hexagonal figure stand with Rey nameplate and. 11.02 H (279.91mm). 6.00" H (152.4mm) x 10.00" W (254mm) x 15.00 L (381mm). Size and weight are approximate values. Thank you for your time and good luck. 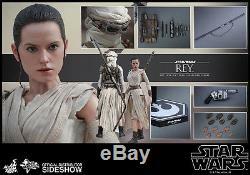 The item "STAR WARS THE FORCE AWAKENS REY 1/6 FIGURE HOT TOYS SIDESHOW withlightsaber" is in sale since Friday, September 16, 2016. This item is in the category "Collectibles\Comics\Figurines". The seller is "kylkessl" and is located in Darby, Pennsylvania. This item can be shipped to United States, to Canada, to United Kingdom, DK, RO, SK, BG, CZ, FI, HU, LV, LT, MT, EE, to Australia, GR, PT, CY, SI, to Japan, to China, SE, KR, ID, to Taiwan, ZA, TH, to Belgium, to France, to Hong Kong, to Ireland, to Netherlands, PL, to Spain, to Italy, to Germany, to Austria, RU, IL, to Mexico, to New Zealand, SG, to Switzerland, NO, SA, UA, AE, QA, KW, BH, HR, MY, BR, CL, CO, CR, DO, PA, TT, GT, SV, HN, JM.